Hi, I am interested in your 1969 Chevrolet Corvette (stock #1710-TPA) listed on Autotrader for $33,995. I'd like to get more information about this vehicle and confirm its availability. 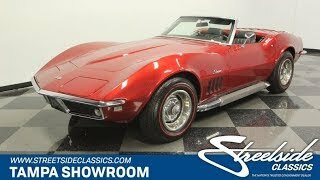 Original where you want it (like the L46 V8) and upgraded where you love it (like on the paint) makes this 1969 Chevrolet Corvette Convertible the cool performance droptop thats offered right now for quite an obtainable price. We all love a red Corvette, and those in the know instantly recognize the factory never offered anything like this in 69. The Dark Red Metallic is a custom application that has a deeper tone and plenty of metallic luster. So its the right custom upgrade you want for a sunshine-friendly classic convertible like this one. And you can also instantly tell this is a Stingray of distinction with the way everything from the headlight covers to the doors line up so nicely. There were nice recent investments in classic pieces like the white convertible top and the mirror-like chrome bumpers. Plus, it has the true look of performance with redline tires and side pipes. So yes, this one really knows how to be memorable. While the white roof looks nice against the red paint, the black interior really gives this a speedy look. So youll happily take the top down wherever you go. This one was built to enjoy with high-back bucket seats, a center console, and power windows. Plus, there are upgrades like cup holders and provisions for an AM/FM/cassette stereo. And nothing beasts the experience of grabbing the grippy three-spoke steering wheel and peering through at the large speedo and tach. Plus, that bright shifter is just calling out for your right hand. Under the hood is the numbers-matching 350 cubic-inch V8. It looks well maintained with good wire, belts, and steel-braided hoses. And while its great to have the original L46 motor still in this car, you also get a terrific feeling of upgraded power thanks to the Holley four-barrel carburetor, Edelbrock Performer intake, and MSD ignition. This enhanced V8 sounds great coming out of the side pipes. Best of all youre in complete control of the power and its soundtrack thanks to the original four-speed manual transmission. These Stingrays are meant to be enjoyed on your favorite road, and thats why this comes with power steering, four-wheel disc brakes, and a fully-independent sports suspension. Complete with owners manual, this is a terrific mix of original and upgraded... and its all offered for a nice price. Call today!! !